Logs are available to collect from our Oswestry-based sawmill from 9am to 3.30pm Monday to Thursday and 9am to 2pm on Fridays. The collection address is: The Log People, Maes Y Clawdd, Oswestry, SY10 8NN. We’re directly opposite Jewsons on Maes Y Clawdd. Just go down the big wide open drive towards Cold Move and turn left where you’ll see a log cabin office. 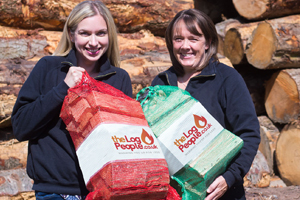 Customers collecting logs from our sawmill automatically benefit from the lowest prices. Think of it as our way of giving something back to you because you’ve traveled to us!